Tell me about your drawing: what is happening here? Because it was burned down and I wanted to honor it. What’s the thing you enjoy the most drawing? It reminds me of darkness. Because drawing has more details and painting is more abstract. Art is basically experience and imagination. Yes. Because I enjoy it. Diego Urbina, 9 years old. There is a super-plane with big wheels flying in the space city. It has a big weapon shooting bombs to defend itself. Why did you paint this? Planes and rockets; because they can fly. Because of the Green Ninja of NINJAGO. Because it is easier and more fun. Paint a lot of canvases. Yes. Because I have painted a lot of canvases and my name is Leonardo, like Leonardo Da Vinci. Emma: We painted our Daddy’s surfboard. We sprayed paint on it. I drew my dad, my sister and me, and other stuff. Amanda: I painted a treehouse to decorate the surfboard. I drew papi and me, and a rainbow, and the place where papi was born: Caracas. 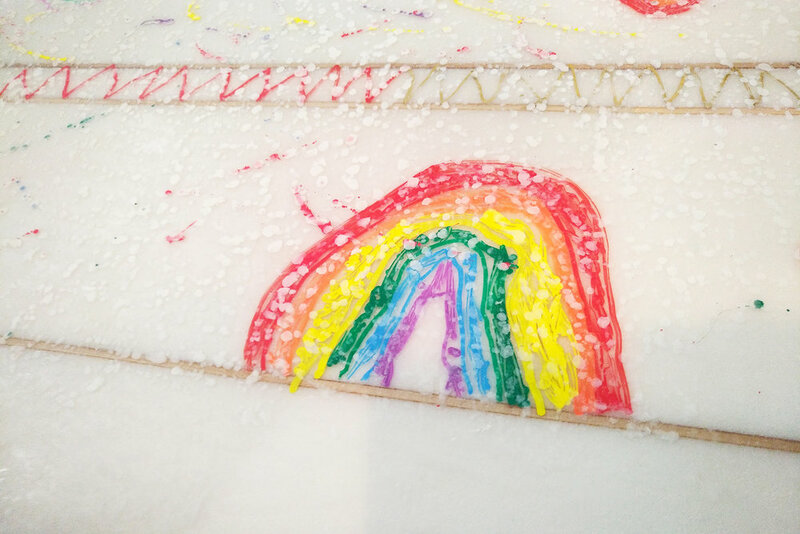 Emma: I also drew a rainbow, because it’s my favorite color. Rainbow is my favorite color. We wanted to make the surfboard pretty because it was all grey and it needed some color. Amanda: I painted a treehouse because I wanted to. I also sprayed red on the surfboard because it’s my dad’s favorite color. Emma: Good question. Because you can draw anything that you imagine. Sometimes I do it to remember something I saw somewhere, others just because I’m bored. Amanda: Because I like Unicorns, and because sometimes I’m bored and I like to draw. I just like it. Emma: It’s colorful, very colorful. Amanda: Because it’s in the rainbow. Emma: Because with painting you have to color in and it takes a long time to do that. That’s the only reason. Emma: Color, paper, and an imagination. Amanda: Wanting to be one. Emma: No, because I don’t like art classes in school. Amanda: Yes, because I like to draw. I live in New York City and there are a lot of cool buildings here. In this drawing, some buildings are real and others are imaginary. I like drawing skyscrapers. I'm attracted by their design and height. It's the brightest, strongest color. I recently got into watercolor painting and I'm really enjoying it! You can mix colors which is super fun. I think art is drawing, whether you draw with pencils or with paint, to me it's still drawing. You need to be good at drawing. I am an artist because I can draw very well. I spend most of my free time creating art and it's something I really enjoy. Destan Cevher, 7 years old.